Muslim Kambohs (Kambojs) became especially influential and powerful during Mughal rule. GeneralShahbaz Khan Kamboh was the most trusted general of Akbar. Shaikh Gadai Kamboh was the Sadar-i-Jahan in Akbar's reign. Numerous other Kamboj are known to have occupied very key civil and military positions through out the Mughal reign. A. L. Basham writes: "The administrative reforms of Akbar changed the structure ofeven the Muslimleadership. The state was no longer the monopoly of the Mughals, or even the Iranis; the Afghans, and Indian Muslims suchas Shaikhzadas, Saiyids,and Kambohsshared in its management. The hereditary status of a new entrant was animportant consideration in assigning his first mansab, but promotion dependedmainly upon talents and loyalty" . 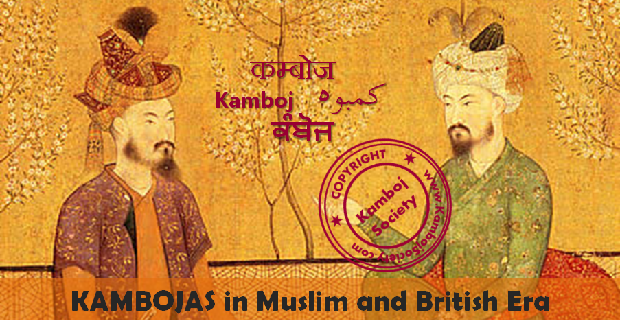 There are numerous notable names of Muslim Kamboj in Indian history which canbe mentioned here but more important of them are listed below and described forthe knowledge of general readers. Shaikh Jamali Kambohwas also known as Shaikh Hamid bin Fazlullah, Dervish Jamali Kamboh Dehlwi or Jalal Khan. Jamali came from a Sunni merchant family of Kamboh lineage but was initiated into Sufism by the respected teacher Hazrat Shaikh Samayuddin Kamboh. Jamali was a noted Sufi of the Suhrawardiyya sect who died in AD 1536 while accompanying the Mughal Emperor Humayun in the latter's expedition to Gujarat. He was married to the daughter of Hazrat Shaikh Samayuddin Kamboh and was the tutor of Sultan Sikandar Lodi. He lived at Mehrauli during the reign of Sultan Sikandar Lodi and later composed panegyrics to the first of the Mughal emperor, Babur and his successor Humayun. A great poet of Persian language, Jamali wrote Siyar-l-Arifin (completed between AD 1530 and 1536) in Persian which is an account of the Chishti and Suhrawardi Sufis of the period. Shaikh Jamai died in 1536 AD and his tomb and a mosque known as Jamali-Kamali is situated near the Qutab Minar opposite the Ahinsa Sthal on Mehrauli's bypass. Not much is known about Bahawuddin Kamboh. He was however an important person in Darbar-i-Akbari since emperor Akbar had deputed him as his embassy to Yusuf Chak , the king of Kashmir, to persuade or force the latter to come to an understanding with Akbar. Amadul Malik was grandson of Shaikh Hasham Khan Kamboh. In the later years of Aurangzeb, he was the chief judge of Lahore. During Bahadhur Shah's reign, Amadul Malik was appointed the governor of Multan. Nawab Amadul Malik held a mansab of 5000 person. ====Nawab General Shahbaz Khan Kamboh==== Shahbaz Khan was one of the most trusted and ablest generals of Mughal emperor Akbar. His real name was Shahrullah and his sixth ancestor was Haji Ismail, a disciple of the renowned saint Bahauddin Zakariya of Multan. He had entered Mughal service during the time of Akbar, drew his attention and was elevated to the rank of Mir Tozak (Quarter-Master General) and later to an Amir. In 1572 he was appointed Mir Bakhshi (Paymaster-General) and the title of 'Shahbaz Khan' was conferred on him. As a Mir Bakshi, Shabaz Khabn introduced the system of Dag-o-mahali which had considerably cut down the over-heads as well as the corruption in the military departments of the Crownr. During 21ist year of his service, Shahbaz Khan proceeded against Kalah Rai and Maldeo Rai, the rebel Rathod Rajputs of Jodhpur and brought them under control. He also attacked the fort of Daigur which resulted in the deaths of numerous Rathods. Later, he also reduced the forts of Dunar and Siwanah and was made commandant of these forts by the Crown. During 23rd year of his service, Shahbaz Khan invaded Komelmer and subdued the pride of Rana Partap. Rana Partap escaped in the disguise of an ascetic to avoid the further wrath of Shabaz Khan. Bahadhur Khan-i-Shaibani and his brother Khan Zaman-i-Shaibani were Amir Viziers in the court of Akbar and both were holding big Jagirs. But they rose in rebellion against the crown. With the help of Shabaz Khan Khan, Akbar crushed the rebellion with iron hand. General Khan Zanan-i-Shaibani was killed in the battle but Bahadhur Khan was executed by Shahbaz Khan Kamboh and Rai Bansi Das Kamboh on orders of the Crown . The princes of Goganda, and Udepore also submitted to him. Shahbaz Khan setup 50 police posts in mountainous regions and 30 in the plains to keep control over the rebellious Rajputs. On 18 May 1583, he was appointed Governor of Bengal. Initially, he had commanded 5000 men and had distinguished himself greatly in Bengal, but later when operating in Brahmputra, he had commanded 9000 strong cavalry (Aina-i-Akbari, Blochman's trans, I, p 399-402). On 15 November 1583, he defeated Masum Khan Kabuli and compelled him to flee to Bhati while Jabbari, an ally of Masum Khan, fled to Kooch Bihar. In 1584, he led an expedition against Isa Khan, initially achieved a considerable success and even ravaged Katrabo, Khizirpur, Sonargaon and Egarasindhur but finally suffered a defeat in the battle of Egarasindur and Bhawal and was forced to turn back to Tanda. With reinforcements sent by Akbar, Shahbaz Khan again marched towards Bhati in 1586 and defeated Isa Khan and forced him to come to an understanding with the Crown. In November 1586, Shahbaz Khan was appointed Bakhshi (Paymaster) of Bengal in which capacity he served for two years before leaving Bengal in 1588. Shahbaz Khan Kamboh had also subdued the pride of Raja Ram Chander Sain, Rai Surjan Handa & Dauda, Raja Gajpati, Rana Sangram and the officers of Surat. He had participated in some of the most difficult expeditions of emperor Akbar and much of the territorial expansion of Akbar was due to General Shahbaz Khan Kamboh. Shahbaz Khan was a very able and efficient General and his military division was always found in excellent conditions. Shahbaz Khan died of illness on 11 November 1606 at Ajmer at the age of over 70 years. He was then on a military expedition against the Rajputs of Rajasthan. Historian Abu-L-Fazl Alami, the author of Aiana-i-Akbari, attests that Shahbaz Khan was a very competent and capable General but Abu-L-Fazal also accuses him of his Sunni fanaticism and arrogance. Many a times, he strongly opposed the emperor, but Akbar had a great regard for Shahbaz Khan and took it lightly. But once, the defiant Shabaz Khan had to be imprisoned and was released only after two years. Emperor Akbar tried his best to bring Shahbaz Khan and another General Qutb-ud-din Muhammad Khan Koka into his new faith known as Din-i-Ilahi but the move was vehemently criticized both by Shabaz Khan Kamboh as well as General Qutb-ud-din Khan. > This had created obstacles in his promotion upwards. On the other hand, many incompetent and junior officers got promoted which they did not deserve. The 9000 strong cavalry of General Shabaz Khan is said to have comprised mostly the Kamboj horsemen which included both the Muslim as well as the Hindu Kamboj soldiers. The total annual expenses on his division was over 30 Lakh Indian Ruppees during those times. Shahbaz Khan so much helped the Kamboj that no Kamboh was in economically bad condition at that time (Abu-L-Fazl Alami). He left behind a huge Jagir and treasure which was seized by Jahangir (Salim), son of Emperor Akbar. Was official biographer of the Emperor Shah Jahan and the teacher of Mughal Emperor Aurangzeb. Little is known of the life of Muhammad Saleh Kamboh Lahori other than the works he composed. He is stated to be younger brother of Inayat-Allah Kamboh and worked as Shahi Dewan with Governor of Lahore. Muhammad Salih is best remembered for his work Amal-i Salih, also referred to as Shah Jahan Namah (The History of Shah Jahan), which work he completed in 1659-60 AD. Amal-i-Salih is an account of the life and reign of Shah Jahan. However, the work also includes information on Shah Jahan's predecessors (particularly Akbar and Jahangir) and a compendium of biographies of the Shaikhs, poets, and other notables who were contemporaries with Shah Jahan. Muhammad Saleh Kamboh died in 1674 AD. (1608-1671): Shaikh Inayat was a historian. He spent his early life in the service of the Mughals and was a Mir Munshi (General) of Shah Jahan, but later retired from the world and lived as a recluse beside a shrine in Delhi. Inayat-Allah Kamboh wrote several historical works, but it was his collection of tales entitled Bahar-i-Danish (completed in 1651 AD), one of the most popular textbooks of Persian, which had brought him the most fame. He died in 1671 AD at Delhi. Historian Muhammad Saleh Kamboh, younger brother of Inayat-Allah Kamboh, has praised Bahar-i-Danish(Springtime of Knowledge) as a model of sophisticated workmanship (See: Muhammad Saleh Kamboh, Vol. 2, 1660: 862). It became part of the syllabi of the Persian schools because it is mentioned in a manuscript-copy of Khulasatul Makatib, written in 1688. Thus it was used in all the Persian schools, and by all educated men and women, both Muslims and Hindus, were acquainted with it in Mughal India. During British rule too, according to the education reports, it was taught in nearly all the schools and its style and idiom were regarded as the best models of composition (Reid 1852: 54). Bahar-i Danis is a "collection of romantic and lascivious tales dealing with the tricks employed by faithless wives to deceive their doting husbands", freely adapted from an earlier Indian source Shuka-Saptati into Persian. His another important work is Takmilah-yi-Akbar-Namah which is a continuation of Abu-al-Fazl's Akbar-Namah as Kamboh narrates the last four years of emperor Akbar's reign. Mian Jamal belonged to Jahangir's era. He was a noted scholar of Persian and Arabic languages. Tarikh Khan Jani v Makhzan Afgfhani addresses him as Fazal-i-Rozgar Janab Mian Ahmed Kamboh Dehlvi (p 516). Around 1614 A.D, Jamal wrote a famous book called Madan-e Akhbar-e Ahmadi in Persian language. The author of Makhzan Afghani pays very glowing tributes to his book. The original draft of the book is said to lie at British Museum London. He was grandson of Khawaja Hasan and was the ruler of Marehra during Akbar's reign. He was the son-in-law of famous general of Akbar, Nawab Shahbaz Khan Kamboh. He was the son of Nawab Mohabbat Khan. After Dara Shikoh was assassinated, he joined Aurangzeb's administration. With competency and his loyalty to the Crown, he was given a mansab of 5000 and was also awarded the title of Kheir Andesh Khan. He was also given an award of 0.7 million Darham for his meritorious military service as Faujdar at Etawa. During Bahadhur Shah's reign, his mansab was upgraded to 6000 men. He held a mansab of 1500 during emperor Bahadhur Shah Alam Sani's reign. was Royal Physician of emperor Bahadhur Shah Alam Sani. Was conferred the title of Hazakat Khan. Hakim Anayat Hussain Mahravi was a good scholar and writer. Wrote many books including Silsilah-i-Aliyah, which treats of the history of the Muslim Kambohs i.e the Shaikh Kambohs. The book contains supplements from Faid Ahmad b. Dildar Ahmad (Meerut). He was brother Asadaulla Khan and son of Ahmed Alla Khan. He was the first Indian to occupy the position Deputy Superintendent of Police and was also conferred the title of Nawab by the English Government. Subhan Ali Khan was the Deputy Viceregent of Ghaziuddin Hyder, the ruler of Lucknow. Mirza Ghalib received an invitation to a reception in audience by the ruler's viceregent and was received splendidly in Lucknow through the mediation of Subhan Ali Khan Kamboh. He was born in the Meerut in 24 March 1841 and came of lineage of Shaikh Abdul Momin Kamboh who held the office of Dewan-e-Tun in Shah Jahan's reign. Vaqar Mulk did his engineering from Engineering College Roorki. He served as a Law Secretary in the Government of Hyderabad Daccan for some time and then joined Revenue Department. Later he was appointed Governor of the newly established State "VRARANGLE" and with his untiring efforts, the state soon became very prosperous. Vaqar Mulk received the title of Nawab Intezar Jung from the Government of Hydrabad. Then he was appointed Revenue Secretary with the orders of Nizam of Daccan. He served as Secretary, Personal Secretary & Advisor to the Prime Minister Nawab Bashiral Daulla. On December 9, 1890, he was awarded the title of Nawab Waqarul Mulk. On October 1892, Nawab Waqarul Mulk joined M.A.O. college in Aligarh, Uttar Pradesh. In December 1906, the quartet Nawab Waqarul Mulk, Sir Agha Khan, Sir Shafi of Lahore and Nawab Salimullah Khan of Dhaka organised a Mohammdan Educational Conference in Calcutta and on the same occasion, they also launched a new party called All India Muslim League of which Nawab Waqarul Mulk became General Secretary. In 1907, he was appointed Honorary Secretary of M.A.O. College. In the same year he resigned from the Secretaryship of the All India Muslim League on health grounds. In 1908, the Government of India honored him with the title of Nawab. It was the magnetising personality of Nawab Waqarul Mulk which had induced Quaid-e-Azam to join the All India Muslim League which fact changed the history of Indian subcontinent. The welcome address given by Nawab Waqarul Mulk on the occasion is an important document for the Muslims. Due to bad health, Nawab Waqarul Mulk gave up the Secretaryship of Aligarh in 1912 and after a prolonged illness, he died on January 27, 1917. Was born in 1877 at Meerut in the renowned Zuberi (Kamboh) family of India. He obtained his M.A. with distinction in Mathematics in 1898 from Aligarh and D.Sc also with distinction from Allahabad University in 1901. His brilliant academic career won him the scholarship to join the Cambridge University, England in 1901 from where he took his mathematical Tripos topping the University and became a Wrangler. He obtained his Ph.D. degree in 1905 from Gottengen University in Germany. For further education Dr Ziauddin joined Peris University and later Bologna University Italy and then on return to India, he joined the alma mater as a Professor of Mathematics. It was due to his untiring efforts that a Medical and Engineering colleges were founded and the Aligarh Muslim College was converted to Aligarh Muslim University where Dr Ziauddin Ahmad worked as a Lecturer, Professor, Principle, Pro-Vice-Chancelor, Vice-Chancelor and Rector respectively. Dr Ziauddin Ahmad can be reckoned as next to Sir Syed Ahmad Khan in the spread of education among the Muslims who owe him a profound sense of gratitude. Dr Ziauddin played a dominant role in the renaissance of Muslim education in the sub-continent after Sir Syed Ahmad Khan and faithfully carried on the torch of education right to the rank and file of the Muslims throughout the sub-continent. As a very faithful successor of Sir Syed, he carried on the task of educating the people in the teeth of opposition when he proceeded to England to receive the coveted Sir Issac Newton Scholorship. In 1917 Dr. Ziauddin was also appointed member of the Calcutta University Commission of which Sir Michael Saddler was the President. Dr Ziauddin Ahmad rendered yeoman's services to the Muslims of the sub-continent, worked for their progress and welfare and devoted all his life to the eradication of ignorance and illiteracy. He became member of Legislative Assembly (MLA) of UP in 1991 and 1922. The second Muslim Kamboh Conference held at Marehra (District Etha U.P) on 21st & 22nd April 1935 in Marison Islamia School was presided over by Dr Ziauddin Ahmed. He was one of the earliest members of the All-India Muslim League and stuck to the organization till the end of his life. As desired by Quaid-e-Azam, Dr Ziauddin became Parliamentary Secretary of the Muslim League in the Central Assembly of India in 1938. Dr Ziaddun remained member (M.P.) of Central Assembly of India from 1930 till 1947. In 1946, he was the chief whip of the Muslim League in the Central Assembly. He was awarded the title of Sir by the Government of India. Dr Ziauddin did an outstanding job in Budget-making for the Indian Railways and later also worked with the Reserve Bank of India and he achieved the goals which the Indian National Congress had fought and lost. Dr Sir Ziauddin Ahmad was a trusted Lieutenant and Associate of the Muslim pioneers like Sir Syed Ahmad Khan, Nawab Waqarul Mulk Kamboh, Nawab Mohsinul Mulk, Sir Sultan Muhammad Khan Aga Khan 111, Syedna Tahir Saifuddin, Quaid-e-Azam and Quaid-e-Millat Liaquat Ali Khan. After partition, the family of Dr Sir Ziauddin moved to Pakistan. In August 1947, he was appointed advisor to Government of Pakistan by Quaid-e-Azam Mr Muhammad Ali Jinah. Dr Sir Ziauddin died on December 23, 1947 and in compliance of his wishes, his body was brought to India and buried within the campus of Aligarh Muslim University. Dr Sir Ziauddin Ahmad's daughter Dr Mrs Aijaz Fatima Tajammul, her husband Dr Tajammul Hussain, and Dr Asim Hussain have done a good job by establishing in Pakistan the important institutions viz: Dr Sir Ziauddin Memorial Hospital, Dr Sir Ziauddin Post-Graduate Medical Institute and Dr Sir Ziauddin Medical College all running under Dr Sir Ziauddin Ahmad University. This was an excellent step to perpetuate the memory of the great scholar and educationist of the Kamboj lineage. Dr Sir Ziaddun was the first Kamboj to have become a member of Indian Parliament (M.P.) and was also the first Kamboj to have been knighted as Sir . He is another very important Kamboh hero of the pre-independence days. Bar-at-law by training, Muhammad Yamin Khan belonged to Meerut and was a prominent legal luminary, statesman, politician, parliamentarian and one of the senior most members of the All India Muslim League. British Government recognized him for his outstanding social and legal services and had knighted him by with the titles of Sir and Nawab. A close confidant of Quaid-e-Azam, Sir Yamin Khan was a member of the working committee of All India Muslim League. He also remained Deputy President of the Indian legislative council. Sir Muhammad Yamin Khan was also the President of the third Kamboh Conference held in Bareilly in 1936. His brother Chaudhry Muhammad Yamin Khan was also a highly educated person and a prominent Judge of pre-independence period. After partition, the family had moved to Karachi, Pakistan where Sir Muhammad Yamin Khan soon died. Sir Muhammad Yamin Khan was the second Kamboj member to be knighted as Sir and also was the second Kamboj member of the Indian Parliament (M.P.) . He joined the State of Malerkotla as a revenue officer, but was soon promoted and worked as Justice, Collector, Accountant General and Police Chief. Later he was also appointed Revenue Minister of the State. After partition and on the merger of Malerkotla into "Patiala and East Punjab States Union" (PEPSU), Babu Maula Bakhash was appointed its Administrator. Secretary Harkaran Ibn Mathuradas Kamboh Multani (d 1631). Harkaran was son of Mathura Das Kamboh and belonged to Multan which was a great center of learning during Mughal reign. Harkaran Kamboh was a noted scholar of Arabic and Persian languages. His father was also a good poet of Persian language. Harkaran is best known for his book Insa-yi-Harkaran written in Persian language (1625-1631) during the last days of Jahangir and early days of Shah Jehan. The work was compiled between 1625 AD and 1631 AD. It is stated that, one day in the reign of the Emperor Shah Jahan, Harkaran Kamboh had sat at "the seat of Empire in the city of Matura" and devoted himself to improving his skills as Munshi (Secretary). There followed a selection of letters to different classes of people indicating how 'princes write to princes', diplomatic (firmans, parwanahs), letters between notables and legal documents including certificate for the sale of a slave girl etc. The result was his famous Insa-yi-Harkaran in Persian language which soon became an established model of excellence. Insa-yi-Harkaran is divided into seven sections and contains models of letters and other documents relating to the State. Furthermore, Insa-yi-Harkaran was also used as a model for diplomatic correspondence with the native princes and potentates by the British in India and also as a model for school children learning Persian-letter writing in the schools. Not much is known about his other works but Insa-yi- Harkaran was indeed considered an excellent book till British rule. In the beginning of his book, Harkaran introduces himself as Faqir Haqir Hechamdan Azhaf Man Abdullah Al-Samad Harkaran Valad Mathuradas Kamboh Multani . He was son of Rai Narayan Das and grandson of Rai Jado. He also wielded a great influence in Jahangir's court. He expanded the boundaries of his village Rai Pur which he renamed as Raipore Bidi Chand. Rai Bidi Chand had two sons viz Rai Dalpat and Rai Khemkaran and one daughter named Bibi Ramo. The total Jagir in the name of Raipur Bid Chand at this time is said to be 52 villages. Rai Bidi Chand gave 8 villages of his Jagir in marriage to his daughter Bibi Ramo. He was an important noble in the Mughal court and held a mansab of 1000 men during reign of Shah Jahan. Two Kamboj colonies in Lahore known as Kambohwaras were founded by Rai Dalpat. He also founded another Kamboj colony in Sutar Mandi. Rai Dalpat Rai had five sons viz Haspat Rai, Bhupat Rai, Gajpat Rai, Raghupat Rai and Narpat Rai. Narpat Rai moved to Delhi and permanently settled there. Rai Gajpat Rai was a high ranking military officer but had embraced Islam during Aurangzeb's rule. He was renamed as Abdul Mahbud Khan Sajani. He was also conferred the title of Nawab. Following the example of Rai Gajpat Rai, the entire Kamboj community of one of the two Kamboj colonies of Lahore also embraced Islam. was a great landlord from Nibber clan of the Kamboj and was a dedicated Sikh of Guru-Ghar. He had two sons viz: Mool Chand and Amar Chand. Mool Chand was a great warrior and had fought valiantly for the tenth Lord in the battle of Nadaun on March 20, 1691 and achieved martyrdom (Ref: Aina-i-Khemkaran; also: Guru Kian Sakhian, Prof Piara Singh Padam, Index). Amar Chand took Amrit and became S. Amar Singh. He was a renowned Sikh warrior from the Khemkaran and would wield in the battles a double-edged sword (Kharasang or Khanda) said to be weighing over 20 Kilogram according to Sikh chronicler Giani Gian Singh (Kharasang swa man ki, jang vich chalaai). After the martyrdom of Banda Singh Bahadhur, S Amar Singh succeeded him and became the chief of the Bandai Khalsa . In 1723 AD, a pernicious fight broke out between the Tat Khalsa and Bandai Khalsa in the Prikarama of Golden Temple. S. Amar Singh gave a memorable fight but finally achieved martyrdom after killing numerous of his adversaries (Ibid). Bhai Mool Chand had a son called Lakha, who took Amrit and became Bhai Lakha Singh. He was such an illustrious warrior that he was nicknamed Lakha Singh Wad-Partapi (i.e. Lakha Singh, the great & illustrious). With the strength of his own arms, he had greatly expanded the boundaries of Khemkaran. He was greatly respected by Maharaja Ranjit Singh who would always address him as Baba Ji. During Ranjit Singh's rule, many Sikh Kambohs of Khemkaran held high military ranks in the regiment of Dewan Sawan Mall (a Chopra Khatri) and later of his son Dewan Mool Raj, both Governors of Multan. But numerous other Kambohs from Punjab were, however, organized into a regiment under Akali Phula Singh (a Kamboj Sikh warrior). After Akali's martyrdom in 1823 AD, most of these Kamboh soldiers are said to have joined the ranks of Dewan Sawan Mall's regiment and later that of Dewan Mool Raj. The Kambohs held Nakodar in Jullundur and Sohna in Gurgaon some centuries ago; and the tombs and mosques that they have left in Sohna show that they must have enjoyed considerable position . Empire and Information: Intelligence Gathering and Social Communication in India, 1780-1870 (Cambridge Studies in Indian History and Society), Cambridge University Press 2000, p 285, C. A. Bayly, Rajnarayan Chandavarkar, Gordon Johnson, and C.A. Bayly; also: Language, Ideology and Power: Language-Learning among the Muslims of Pakistan and North India, 2002 - Oxford University Press, USA, p 126, Tariq Rahman.